Bimble: verb. To casually walk or stroll. Sometimes used in the phrase ‘death bimble’, when referring to a walk that was intended to be leisurely, but veered out of control when either additional distance or incredible altitude is added unexpectedly, usually through the presence of Luke V.
Dear readers, we have reached the end of the second week of our great Mongolian tour, and the westernmost point of the journey. 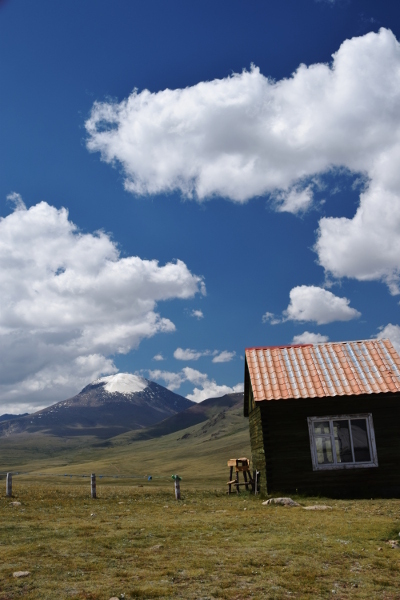 The minibus, complete with its seven occupants, stood at a gate looking across to one of Mongolia’s three tallest mountains. We looked ahead, not only at the impressive ridgelines and beckoning snow, but also to a day in these mountains with no motorized accompaniment. 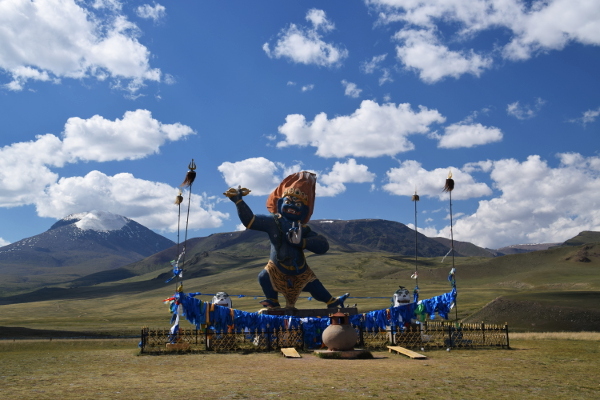 A Buddhist god and defender of the region (‘and all Mongolians’) looked back at us, his statue standing watchfully at the base of the sacred mountain. When our guide said his name it sounded like ‘Otchurwan’, but later I couldn’t find anything that is spelled or sounds similar on the internet. In any case, he’ll need to look out for us the next day, as we set off with a limited amount of water, no map, and no compass, for a jolly bimble up some mountains. One of the main challenges was convincing driver and guide that we could do this. Just leaving from camp, without need for a car seemed an incredibly unusual approach. Lunch also posed a problem. The concept of a packed lunch was clearly one that these Mongolians had not encountered before. Our guide, intending to come with us, emptied her make-up bag (a 20 L backpack) and packed an entire jar of pickles and a whole sausage before we were able to explain that we wanted to prepare the sandwiches in the morning and then take them with us. By the end of the food explanation and why we didn’t want to take a jar, our guide had decided that she’d just let us head off alone, and do it our way. The Otgontenger mountain range is a little stretch of paradise after being cooped in a vehicle for neigh on two weeks, a chance to really stretch our legs and get some views, and so of course we chose the route that looks the most exciting. After crossing the river (much to our driver’s concern, on foot), we headed straight up a hill and up to a rocky ridge. Here we decided not to skirt round to the easy grass bit, but all five of us began a scramble, climbing up the rock, around outcrops, and balancing along the top. It was even more exhilarating because no one was there to tell us that we were doing something dangerous. We laughed when we imagine the tour guide and driver’s faces if they could have seen us, and were quite thankful they decided not to join in for the day. We adventured upwards until shortly before lunch when we had crossed the 2000 meters above sea level line, and then returned down towards the river to refill water and have lunch. The marshy area was riddled with holes and boroughs and was perfect for twisting ankles, but we persevered and headed up the next hill after lunch, looking for snow. We finally found some once we had summited the next crag and turned towards ‘home’, on the way down. After an impromptu snowball fight, we discovered some bad news. The walk just kept going. And going. And going. 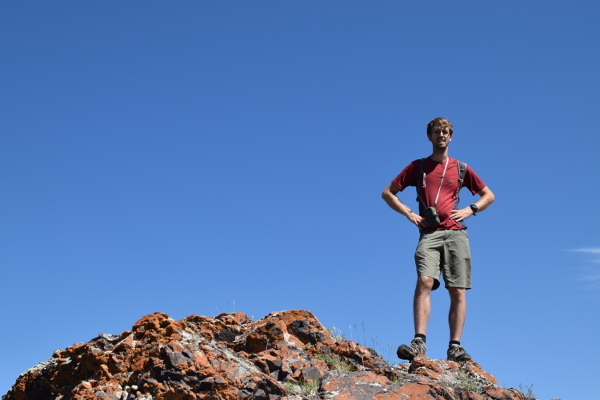 Luke has a special talent at choosing the longest possible route you can do in a day, and this walk proved no exception. The return journey, which had been thought of as a quick cut-across the scenery back to camp, actually doubled our distance, and was constantly on a slanted hillside that was incredibly difficult on our feet and legs. I was continuously assured that it was ‘just around the next corner’, and perpetually annoyed when this was not the case. Exhausted and hungry, my mood plummeted, while Luke tried to remain cheerful. No matter how much he tried, though, I completely broke down after falling in the river as we crossed it to return back. Sitting in shallow water, just having saved my camera but drenched my shoes, I burst into exhausted laughter and tears. 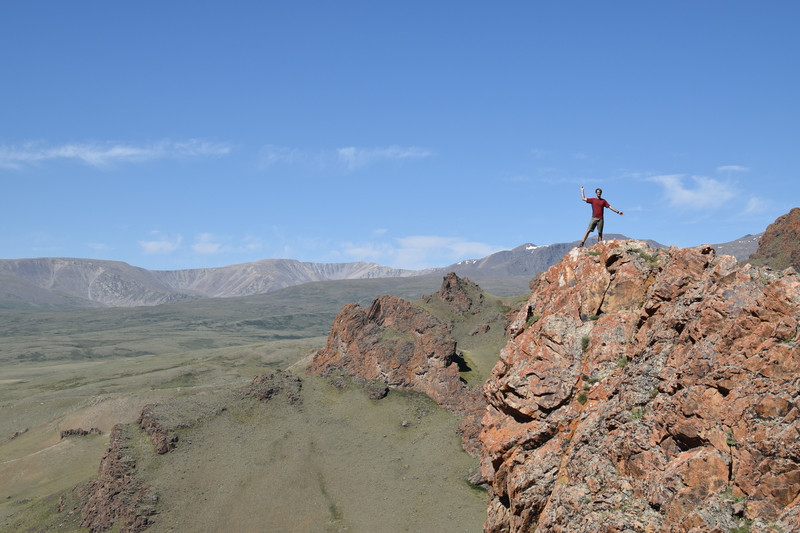 Nevertheless, climbing those crags will remain one of the best memories of Mongolia- a day where we pushed ourselves and really got to experience the nature, under the careful watch of a majestic mountain and a breathtaking blue sky.